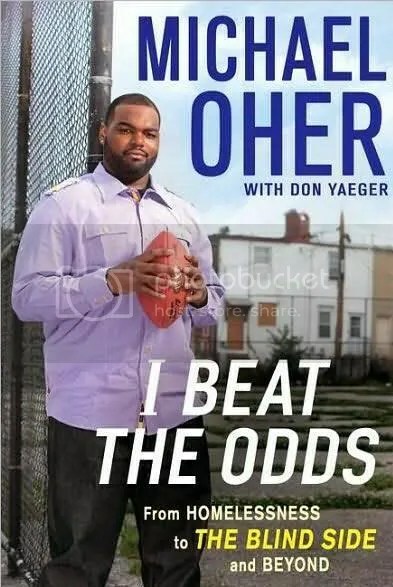 I was fortunate enough to score a review copy of Ravens tackle Michael Oher’s new book I Beat the Odds: From Homelessness to The Blind Side and Beyond. In the book, which Mike wrote with Don Yaeger (Sports Illustrated, Running for My Life, Pros and Cons, Never Die Easy, more), Oher attempts to fill in some of the gaps of his life story, gaps that were left out from The Blind Side book and movie, as well as to offer up hope and advice for kids who may find themselves in situations similar to the one Oher found himself in as a young boy. 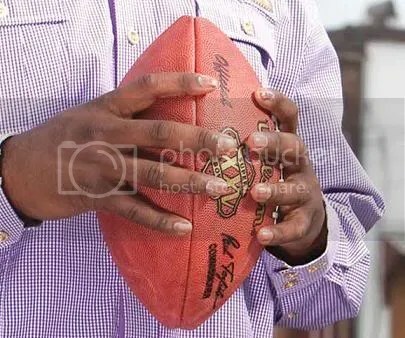 The first thing that struck me about the book was the cover – that’s a Super Bowl XXXV football in Oher’s hand. Mike obviously wasn’t with the Ravens back in 2000 when they won their only Lombardi Trophy to date, but I thought this was a nice gesture to Ravens fans on his part. “I know the history of this team, and I’ll help us get back there,” is the implied message, to my mind at least. I know they say you shouldn’t judge a book by its cover, but I broke that rule and already found myself with a favorable impression of I Beat the Odds before I even cracked it open. Once I started reading, I realized that the cover – while nice – was far from the only redeeming quality of this book. Oher, through the help of social workers who actually worked on his family’s case years ago, attempts to piece his life together for the reader, digging up many memories that he had long repressed. We learn about Oher’s life before he was fortunate enough to meet the Tuohy family (which wasn’t until high school), when it was a constant struggle for he and his many siblings. With a mother that was on and off drugs (though on more than off) and who, while loving, often put her addictions ahead of her family on her priorities list, Oher’s young life was the kind that many of us luckier individuals try to convince ourselves doesn’t exist in America. From hanging around neighbors’ houses waiting for an invite to dinner or to sleep over – oftentimes the only way food or a bed was going to happen – to being taken in by “the system” and being separated from his mother and siblings as they were placed in separate Foster homes, there was a lot more strife and stress to Oher’s life than just what we saw in The Blind Side. Michael does a wonderful job putting the reader in his shoes, articulating the feelings of anger and confusion that go through a young person when they are taken from their family, despite outside impressions that what is being done is “for their own good.” I would always wonder why a kid would be reluctant to leave a situation where they didn’t even know where their next meal was coming from, for a “better” home, even if that home didn’t include their neglectful parents. Through Michael’s words, I now better understand the mindset of a young child being bounced around in the system. Oher has stated that his biggest problem with the way The Blind Side film portrayed him was the scenes where he was being taught (either by S.J. or Leigh Anne Tuohy) how to play football. In I Beat the Odds, Mike makes it abundantly clear for the reader that his athletic prowess was with him from a young age, and that he always saw sports as his best chance to make it out of the ghetto. Oher was a star on the neighborhood basketball courts and run-down football “fields” long before he ever stepped inside Briarcrest Academy. If you liked The Blind Side, you’ll definitely enjoy this book, which is in many ways a prequel to the Michael Lewis book and subsequent film. However, in addition to just recommending this book to football fans and those who enjoyed Oher’s story, I would also highly recommend it to those who encounter at-risk children or teens in either their personal or professional lives. While Oher seems to enjoy getting out his own story in his words, it is clear that his real purpose for writing this book – and his true intended audience – is the kids. Kids like he was, who are confused and angry and hurt by a world that seems to not care for them. Social workers, teachers, “big brothers” or “big sisters,” mothers, fathers, aunts, uncles, cousins, or anyone else with young kids in their lives: this book is for you, and for those kids. Many times in the book, Oher is very clearly speaking directly to kids who may be in situations like the one he was in, offering empathy, advice, and words of encouragement from his own experience. Even if the child in your life is “better off” than Foster kids or kids in urban neighborhoods, there is something in here for them. It is written with children in mind (that is, at about a middle school reading level), so this book would, without a doubt, make a great gift for any young person. If this sounds like something you or a child in your life would like or benefit from, go out and pick up a copy of I Beat the Odds today. Update: “Melissa,” a 5th grade teacher in Baltimore, was our winner. I think this book will be great for those kids. Congrats, and thanks to all who entered. If you didn’t win, go out and get a copy of “I Beat the Odds” anyway! This entry was posted on February 14, 2011 at 10:03 pm and is filed under Contest, Ravens. You can follow any responses to this entry through the RSS 2.0 feed. You can skip to the end and leave a response. Pinging is currently not allowed. May I say that, as a disableled challenged individual and a HUGH Ravens fan, I can relate to Michael Oher’s book “I Beat the Odds” because I had to beat the “odds” with my disabilities. While “normal” people can go about doing things in their “normal” way, I had to struggle doing the same things by retraining my mind to do them. Being persistence and having the will power I was able to achieve doing the things I saw normal people doing things they take for granted. (walking, speaking, dressing themselves, bathing, feeding, etc). I’m a teacher in Baltimore city and this looks like it would be GREAT for my kids. Thanks! Very cool that you are giving away a copy, and promoting the story of Oher, which is one of the best stories in recent memory, regarding sports, IMO. I am a teacher in Delaware and a Ravens fan! It would be great to read this book to my class. Mike has an inspirational story which my students would benefit from reading about. I need to get them this book. Obviously you aren’t Anne Arundel County teachers, they just always played the movies for me. What is this reading stuff you speak about? Mikes a great dude. I met him a few times. I can’t wait to finish reading the book. It’s great so far. I obviously need to read this book as I am a Juvenile Court Counselor in NC and a big RAVENS fan as well. I, through my work, often work at placing children out of their home and am working with juveniles who are definitely deemed “at risk”. I have ordered kids to read certain books before and maybe this is a book I should recommend and give to others. I am reading this book and feel that it has a lot of appeal to the alternative students that I teach. I will probably use this book in English 9 with my twelve students. I was wondering if there was a study guide to use with the book to explore connections students make with the book and their lives? I don’t want to remake the wheel, but I’ll begin to do this so I can use this book first thing in August. Thank you for beating the odds! I love this testimony from Mr Michael and i believe that God has great plans for whom ever hands it falls into. i work with kids that are incarcerated and i think that this book would bless them abundantly.